President Barack Obama presents former United States Marine Corps pilot, astronaut, and United States Senator John Glenn with a Medal of Freedom, Tuesday, May 29, 2012, during a ceremony at the White House in Washington. 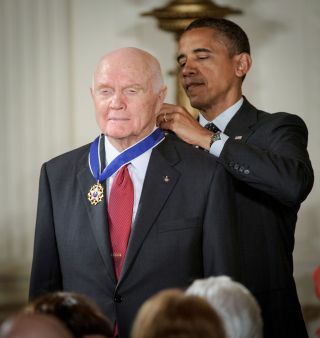 John Glenn, the first U.S. astronaut to orbit the Earth, was honored by President Barack Obama with the Presidential Medal of Freedom during a ceremony held at the White House on Tuesday (May 29). Glenn was present at the event with this year's 12 other medal recipients, including influential musician Bob Dylan, former Secretary of State Madeline Albright, and Juliette Gordon Low, who founded the Girl Scouts in 1912. "This is the highest civilian honor this country can bestow, which is ironic because nobody sets out to win it," Obama said, addressing what he described as a "packed house." "No one picks up a guitar, or fights a disease, or starts a movement thinking, 'You know what? If I keep this up, in 2012 I could get a medal in the White House from a guy named Barack Obama.'" "But that is precisely what makes this award so special," the president said. Glenn, 90, is a former Marine Corps Colonel, NASA astronaut, and Senator. On Feb. 20, 1962, he became the third U.S. astronaut in space and the first to circle the planet. "On the morning that John Glenn blasted off into space, America stood still," Obama said before presenting Glenn with the Medal of Freedom. "For a half an hour, the phone stopped ringing at Chicago police headquarters. New York subway drivers offered a play-by-play account over the loud speakers. President Kennedy interrupted a breakfast with congressional leaders to join 100 million TV viewers to hear the famous words 'Godspeed John Glenn.'" Nearly four decades after his first mission and a quarter century after being elected to Congress, Glenn lifted off on board the space shuttle to become the oldest person to fly in space. "The first American to orbit the Earth, John Glenn became a hero in every sense of the word but he didn't stop there serving his country. As a senator, he found new ways to make a difference. And on his second trip into space at age 77, he defied the odds once again," Obama said. "He reminds everybody don't tell him he's lived a historic life," the president continued. "He says 'are living,' don't put it into the past tense because he still has a lot of stuff going on." The honor came three months after NASA and the nation celebrated the 50th anniversary of Glenn's Mercury-Atlas 6 mission aboard his Friendship 7 spacecraft. In addition to referencing Glenn's spaceflight experiences, the award was also in recognition for the Senator's political achievements. Glenn was an architect and sponsored the 1978 Nonproliferation Act and served as chairman of the Senate Government Affairs committee from 1987 to 1995. The Apollo 13 Mission Control team, led by Sig Sjoberg, Glynn Lunney, Milt Windler, Gerry Griffin and Gene Kranz, as well as former Johnson Space Center director George Abbey, were also recognized by President Richard Nixon with the Presidential Medal of Freedom.